Can I sell my homemade wine? What kind of license do I need to obtain to do that? Guess what it says you may not do, under any circumstance? Sell it. Before you make any wine for commercial purposes, you first need to submit an application to the Alcohol and Tobacco Tax and Trade Bureau (TTB) and get their approval. You’ll need to decide your business structure (as in, are you going to be a bonded winery or a customer at a commercial crush operation? ), and submit various applications, including with the IRS (to make sure you’re paying tax on your sales! 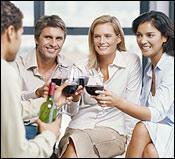 ), labels and a bond to underwrite your payment of federal taxes on your planned wine sales. If you want to turn your home into a legitimate winery, you’ll need to register with the FDA, and there might be state, county and local laws that cover everything from water rights to licensing and distribution guidelines. If that doesn’t sound complicated enough, this process is currently halted due to the partial federal government shutdown. I don’t mean to be discouraging, but I want to make sure you know what you’re getting into. There’s much more information at the TTB’s website, including online application forms. Good luck!